For more information, contact Dr. Erfan Haghighi (erfan.haghighi@cluttereawag.ch) or Dr. Joaquin Jimenez-Martinez (jjimenez@clutterethz.ch). Direct and indirect phototransformations are important processes for the abatement of organic contaminants in the aquatic environment. Dissolved organic matter (DOM) is the main absorber of sunlight in most surface waters and can induce the indirect phototransformation of a variety of organic contaminants, thus enhancing their transformation in the aquatic environment. The dominant reactive intermediates in these indirect phototransformations are currently assumed to be excited triplet states of the DOM. 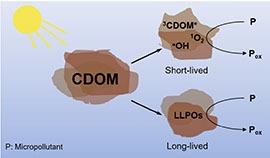 However, there is evidence that other photooxidants, formed upon absorption of sunlight by DOM and termed as long-lived photooxidants (LLPOs), are particularly effective in the phototransformation of electron-rich contaminants. These still largely undefined photooxidants might drastically enhance the abatement of such contaminants with respect to current estimates. The main goals of the overarching project (funded by the Swiss National Science Foundation) consist in identifying the classes and types of contaminants prone to transformation induced by LLPOs and in characterizing the chemical nature of LLPOs. Within the master thesis project, diagnostic kinetic tests are planned to elucidate the chemical nature of long-lived photooxidants (LLPOs). These kinetic tests will consist in investigating the effect of oxygen concentration, pH and addition of scavengers of LLPOs on the rate constants for the indirect phototransformation of selected organic contaminants. The evaluation of the transformation induced by LLPOs will be done by quantifying the difference in pseudo-first-order transformation rate constants measured for two initial concentration values of the selected contaminants (1.0 × 10˗7 M and 5.0 × 10˗6M, respectively). Further experimental methods will include steady-state irradiations using photoreactors and HPLC analyses to quantify the residual concentration of the studied contaminants. For further information, contact Dr. Silvio Canonica or Stephanie Remke.